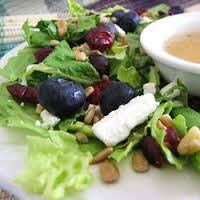 The kick of fresh ginger coupled with the sweet berries, nuts and tangy goats cheese makes this a great winter salad. Make the dressing by whisking all dressing ingredients in a bowl. Season to taste and set aside. 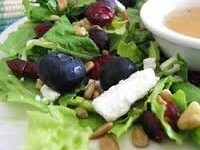 In a large bowl toss blueberries, pecans with a bit of dressing, add mixed leafy greens, a bit more dressing and a pinch of salt. Toss until greens are evenly coated, then throw in the bits of goats cheese. Serve immediately.